Two of the most important properties of pellet fuels are the moisture content, and inorganic ash content. The Pellet Fuel Institute (PFI) standards require that for even the lowest commercial grade of pellets, the moisture content cannot exceed 10% and the inorganic ash content cannot exceed 6%. This means that great care must be taken when choosing and drying feedstocks for pelletization. Testing for moisture and ash can be a time-consuming process. The ASTM standard test methods can take upwards of 4 hours and require an oven, a furnace, and a mass balance to run. 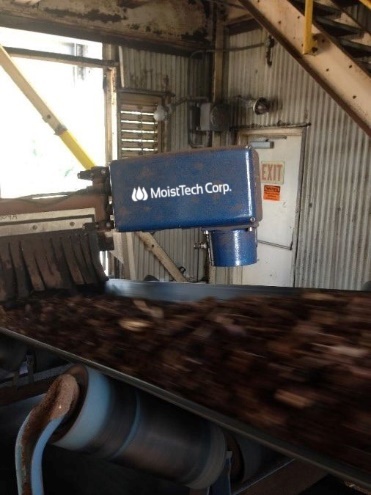 Moisture measurement and control is a crucial aspect in the bioenergy application and MoistTech’s new IR3000 Moisture Sensor allows you to do instant, non-contact, continuous moisture measurement. Unlike other instrumentation of this type, some of the unique features of the IR3000 is that it can monitor the product even with small gaps in product flow and is unaffected by ambient light without impacting the accuracy. The IR3000 is also ideal for installations on chain conveyors and screw conveyors. MoistTech recommends installing sensors in several locations throughout the pellet process. First, installing a sensor prior to the dryer will monitor the moisture levels going in. Too dry of a product will result in over drying causing a dusty, ambient environment but could also result in a fire. Installing sensors after the dryer, prior to the pelletizer will also result in significant cost savings. Product too dry will prevent pellets compacting and not molding together very well. Product too wet could cause the pelletizer to plug up – both resulting in shutting down the line and product waste.